Years ago when I was in the middle of hell a Hollywood film development executive, I worked 24/7. I also made no money, but on my birthday I would buy either a bag, shoes, or jewelry. For a few years (until the production company I worked for shut down) I alternated between which item to get, went go to Barneys, and put down my Barneys credit card. I would pay it off immediately with birthday money I received from my family. I didn’t go crazy. I would buy, say a pair of Prada shoes (back then the prices were at least $200 lower) instead of Louboutins. That said, I think Marc Jacobs bags were/are completely over priced. Can someone please explain their price points to me? One particularly heinous year, I doubled down and bought a bag AND earrings. 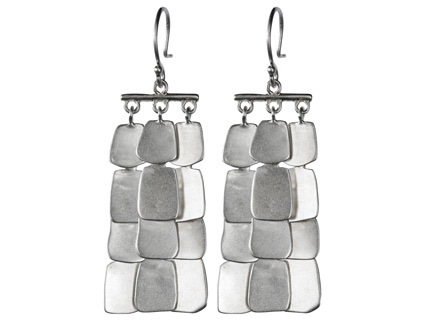 That year I walked pass the jewelry section on the first floor and a pair of earrings, similar to below, caught my eye. For a while I only wore the earrings on special occasions. Then I thought that didn’t make sense. Beautiful things should be worn. These earrings are the only Me&Ro pieces I own. I love them and look forward to buying more pieces in the future. The designer and CEO, Robin Renzi, used to be a dancer and started her company in the back of her Elizabeth Street apartment in the early ’90s. Me&Ro works with recycled materials and their designs are simple and stylish. The company has really grown since the mid 00s but the quality is as high as ever. Also, I like that they still make and produce all their jewelry in Tribeca, New York City. I’m sure they could increase their profit margins if they shipped those jobs overseas. That they’ve been in downtown NYC all this time says a lot about the company’s values. You should check out their website. Their work is just beautiful.